Ever since Taylor guitars made their appearance during the 1970’s, they’ve always been expensive instruments. Just like Fender and Gibson, Taylor had a reputation for catering to professionals with money. However, the last few years have seen a big change in how they approach the market, which has led to designing more affordable models with quality sound. The Taylor 110e is one of them. Where the 110 model (non-electric) is only about $50 cheaper than the electric model, it’s definitely worth paying the extra money and getting more options. 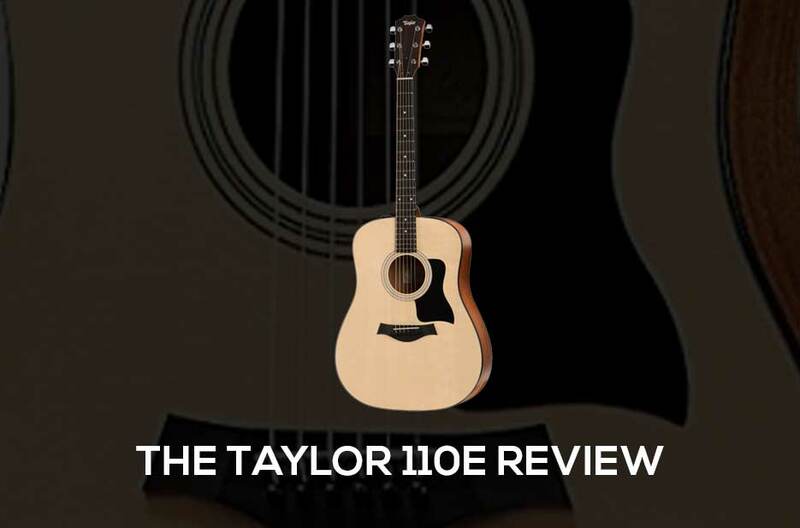 Just by looking at the Taylor 110e you know it’s something that you’ll enjoy picking up and playing. It’s a standard dreadnought shape with 6 strings and a solid Sitka spruce top. Even though mahogany is the more popular choice for the neck, the sapele alternative doesn’t disappoint. Indian rosewood was chosen for the headstock overlay and the soundhole rosette is synthetic plastic. Moving down to the ebony fretboard, which is great for playability and even durability, you’ll find Pearloid dots. The bridge is also made of ebony, while the nut and saddle are made with tusq. Some players might prefer ivory or bone, but tusq shouldn’t be underestimated in this case. The neck measures 1 11/16 inches and has a 15-inch radius, providing enough room for comfortable chording over the 20 frets. As for the length of the guitar in total, it’s 41 inches. The look is finished with a glossy varnish and a natural color. The back and sides are sapele laminated, which is where the discounted price range comes in. Instead of using the more expensive mahogany or tonewoods, Taylor has nailed the cheaper alternative without compromising too much on quality. Now you get a slightly brighter sound and it more than justifies the price. Without beating around the bush too much, this is a solid axe that can cover an array of styles. Saying that it’s best for rockers, folk or country musicians would be a mistake, because its versatility means there aren’t any limitations in terms of style. As for the pickup system, the 110e models use an Expression System Transducer, which retains the quality acoustic sound when plugged in. Whether you play with or without an amp, the sound is incredible. You can hammer out chords without distortion or any other equalizer volume failures, while you can also take a softer approach and still enjoy the great sound. Fingerstyle picking is a dream on the Taylor 110e and the sheer adaptability of the instrument remains a top selling point. So whether you want to strum a soft ballad or rip out some heavy leads, this axe is going to handle it perfectly. There isn’t much you can say about the Taylor 110e that is negative in nature. The only possible problem players might have is the sapele laminated sides and back. Even though it won’t degrade much as the years pass by, it’s not going to build as much character as a solid wood design. Other than that, you probably won’t find anything wrong. Thanks to the price and versatility, it’s suitable for beginners, intermediate and professional players. It’s not the type of guitar you’ll outgrow quickly, if ever, and the quality of the sound along with the sturdy design makes it a long-term companion. It also doesn’t matter what type of style you want to develop, because the balance in playability (flat-picking, strumming, lead etc.) is true to the quality of a typical Taylor guitar. Compared to other budget brands the Taylor 110e is not the most affordable. There are other quality models that go for less, but when you consider the name behind the guitar and the fact that you can do just about anything on it, you might want to spend the extra money. What about suitability in the studio? As may expect, the tone is crisp and clear enough to make a studio session well worth the effort, especially when it runs through an additional transducer mic. So when it comes down to it, the Taylor 110e is another amazing addition to the Taylor guitar range.